This has been a hard, hard day. We spent a good portion of it at the vet's office. And another good portion fighting back tears, sometimes successfully, oftentimes not so successfully. Our poor giant of a dog is wasting away and we're not sure what's ailing him. In his prime, Olaf was probably close to 120 pounds. When we put him on the scale today at the vet's office, we were shocked to see that he's now 76. Under that huge fur coat he's just a skeleton. He's lethargic. He hardly eats anything. He drools, which he's never done before. He doesn't even manage a tail thump when you pat his head. Taking him to the doctor today, we highly doubted that he'd be coming back. We told the kids this, because we didn't want them to feel blind sighted , and they reacted about how we expected they would. It was a hard day. I was so thankful Lyle was with me. He actually had to carry Olaf into the exam room. The nurse took a look at him and said that she'd take him into the back room and have the doctor examine him there. That can't be good. When the doctor came to talk to us, he said, "I don't know what he has, but I know he's very, very sick." His temperature was 105 and his heartbeat, which he said should be about 80, was 200. His gums were not their normal pink color, but a sickly gray. They started him on IV fluids and began blood work. We returned 2 hours later and learned that the blood work, surprisingly, looked normal. They took radiographs and there were no obvious masses. Cancer is rampant in the ranks of berners, so we thought for sure that's what they'd find. 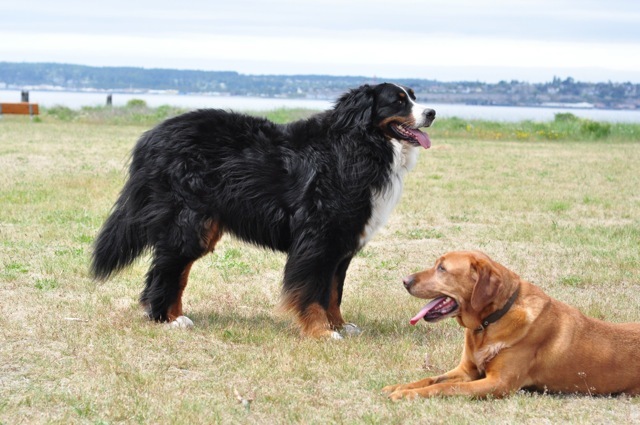 He's not even quite 7 years old, hardly geriatric, but with the bane of cancer, Bernese Mountain dogs have an average life expectancy of only 8 years. With the IV fluids, Olaf's gums have pinked back up and his heart rate is down, but the doctor still suggested we transfer him to an emergency center to spend the night. We elected instead to bring him home. As long as he's reasonably comfortable, he's happier here and the kids wanted so badly to see him on our porch once again. We need to check in with the vet tomorrow and we have an appointment scheduled for Monday. The best case scenario is that he has some raging infection and that the meds he's on now will knock it out. That's what we're hoping for and we owe it to him to try that route. But if that's not what it is, we also owe it to him to stop his suffering. With all that he's given to us over the years, that's the least we can give him in return. Please, oh please let it be an infection. What we wouldn't give to see him looking like this again. Praying for you. My cousin's recently had something like this happen to their Beagle, Bentley. He had very similar symptoms and ended up having Menengeitis. I didn't even know dogs could get this. He ended up recovering fully. Might be worth asking the doctor if it is a possibility. Bentley had a 105 fever as well...praying Olaf bounces back just like she did! One of our cats had a virus last year that sounds similar. He is real fluffy with fur so we didn't realize how skinny he was until he could barely walk and we had to carry him into the car to get to the vets. I told the kids to say goodbye before we left too. All his blood work came back normal. He was given sub-q fluids and some strong anti-biotics. We brought him home and I made him a "hospital room" in my bathroom upstairs. I had to watch and make sure he was eating and drinking and using the litter box. So I needed to keep him away. It took a few days but he made a full recovery. He is still with us and has not gotten sick like that again. Never really found out what caused it. Hopefully Olaf has something similar to that. I hope you get good news, I know how sad you must all be right now. My thoughts are with your family. This breaks my heart. What a beautiful handsome dog Olaf is. Just last January, I had to make the decision to let my snuggle pppy Mesa go back to Our Heavenly Father. It was so unexpected since she was not quite 6 but had bone cancer. Prayers with your family and Olaf. I do believe we will see out loved pets in the hereafter.